The Pulmonary Explorations Unit in collaboration with the Neurophysiology Unit at the Lebanese Hospital Geitaoui-UMC offers ''state of the art '' monitoring tests for both Sleep and Epilepsy studies for premature , children and adult patients. Sleep Apnea can be a cause for serious health problems. Some children can have their growth and intellectual performance affected. Over time Sleep Apnea can cause high blood pressure and lead to a higher risk of Heart Disease . Feeling Sleepy during the day , such as during work ,school or driving may generate many major problems. The Single Breath test DLCO . 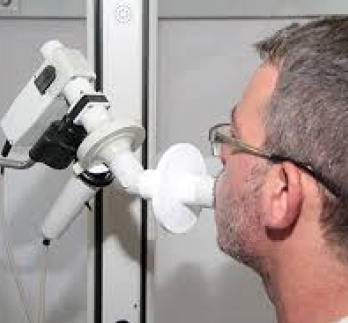 The PFT is a physiological test that measures how an individual inhaled or exhales volumes of Air as a function of time. Assessing therapeutic interventions and many other issues. 3. Interventional Bronchoscopy: Airway Stent placement (Airway Obstruction : lung Cancer , Post IntubationStenosis...), (Cryotherapy ( Lung Cancer Bleeding ...), etc.